PDFPen for iPad was released just before I hopped on a plane to head down to Macworld|iWorld in San Francisco. I read a quick review of it and then purchased the app, closed down my iPad, and jumped on a plane. While airborne I got an email from my real estate agent saying that he needed some paperwork signed for the home my wife and I are purchasing. I used iMessage to tell my wife to sign the paperwork on her Mac and then send me the file. At this point I could have pulled out my MacBook Air and paid another Wi-Fi fee to connect it, but I had PDFPen on my iPad — why not give it a go? I did and it worked fantastically well. You might be thinking that there are hundreds of apps on the App Store that can do this same thing, and there likely are, but PDFPen has some really great things that made me love it. 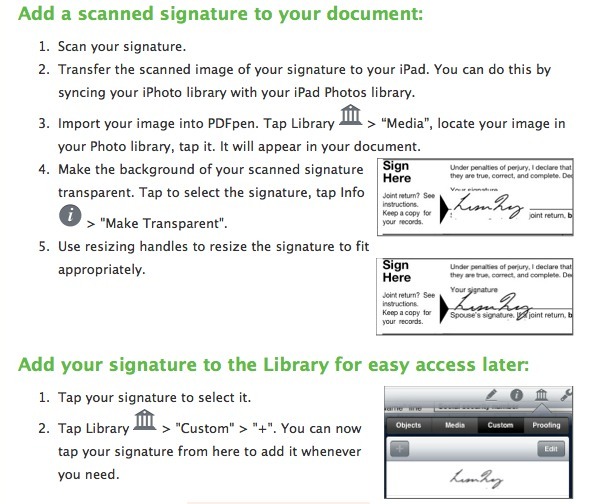 If you have PDFPen on your Mac, then PDFPen for the iPad will sync the files between the two applications over iCloud. Unless you are a heavy PDF user this likely doesn’t seem to be all that life-changing of a feature, but it still is pretty great. The iCloud support in iOS and Mac applications has become a fantastic Dropbox like utility, but unlike Dropbox it is something that is built-in at the system level. You don’t have to think about it and that is key. So when I sent out 4-5 signed PDFs from PDFPen on my iPad and a few days later was sitting at my MacBook Air with a need to resend a couple of those documents — I didn’t need to go find my iPad. All I had to do was grab those PDFs in PDFPen and resend them. They were just there. It’s these really small moments that add up to a product that just fits in your life. More developers need to add iCloud syncing — it really is great — and I am glad PDFPen has it. I love that feature and have already added not just my signature, but my initials as well. It’s a nice little touch and I can imagine there being some really great uses for this (including storing company logos). One of the most annoying problems that I run into on a weekly basis is filling out a PDF, sending it to a Windows user only to get an email back saying that the document isn’t filled out. I don’t know why this is a problem on Windows, but the layered approach that Preview seems to take on the Mac is not compatible in a universal manner. The solution has always been to fill out the PDF and then print the file to a PDF — thus flattening the document. The fine folks at Smile must have had this problem too because when sending out the PDF in PDFPen you can choose to send it as a flattened file (printed PDF) if you want. The icon. I have never been a fan of the styling that Smile uses for its icons and PDFPen is no exception. I know that I pick on icons a lot, but a good icon is a good icon. A bad icon is one that I never want on my home screen — so if my home screen is your goal, you better make your icon good. Like I said before, I am not a PDF guru. However I am a real estate professional and PDFs are a norm in my business. There’s nothing missing from PDFPen for my needs, which takes me just one step closer to not needing my Mac at all. In fact, I didn’t even need my MacBook Air at Macworld until I recorded a podcast — a large part of not needing the Air was because of PDFPen for iPad.